Hong Kong SAR's Chief Executive, Mrs Carrie Lam, delivered a 2019 Lunar New Year message from Government House on Chinese New Year's Eve. "The Lunar New Year is an important festival for Chinese people. It is also a time for families to get together. When the Lunar New Year approaches, many people will do their festive shopping. 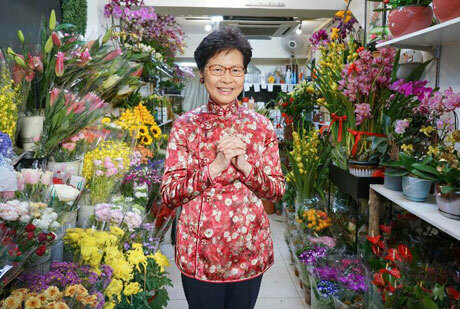 I also took a break from my busy schedule and went to Sheung Wan to buy some dried seafood and flowers. I chatted with shop owners and staff, and took the chance to extend early New Year greetings to members of the public and exchange good wishes with them. This year is the Year of the Pig. I wish you all a healthy and prosperous year ahead." 2019 Chinese New Year Celebrations in Hong Kong for the Year of the Pig run from 30th January to 19th February 2019. LUNAR NEW YEAR FAIR (FLOWER MARKETS) of which the largest and most popular are at Victoria Park, Causeway Bay and Fa Hui Park, Mongkok. About half the stalls at these fairs sell colourful flowers and plants, whilst other stalls sell decorations, foods and gadgets. The fairs operate from 8am to midnight, 30th January, 31st January, 1st February and 4th February, 8am to 3am on the following day on 2nd & 3rd February and midnight to 8am, 5th February. Admission is free. Shops at the year-round Mong Kok flower market, a popular tourist attraction at Prince Edward Road West and Flower Market Road open 24 hours a day on the two days immediately before Lunar New Year's Day. Prior to the parade there will be a pre-parade street party with procession and roving performers along the parade route from 6pm. Local young musicians will perform live music at ten music zones and there will be dance troupes, magic shows and clowns. 350 youngsters acting as "Lucky Buddies" will distribute 13,000 festive gift packs containing food, drinks and small gifts to spectators. The parade, sponsored by Cathay Pacific for the 21st consecutive year, will leave Hong Kong Cultural Centre at 8pm and will enter Canton Road at about 8-30pm, Haiphong Road at 8-50pm, Nathan Road at 9pm and finish outside the Hong Kong Sheraton Hotel and Towers at 9-45pm. Tickets for the spectator stands go on sale at 10am on Saturday 26th January 2019 at Hong Kong Tourism Board Kowloon Visitor Centre at Star Ferry Concourse, Tsim Sha Tsui on a first come, first served basis. Tickets are priced at HK$300, HK$450 and HK$480 and each person can purchase a maximum of 4 tickets. Visitors will be given a numbered tag to purchase tickets at a designated time on the same day. NINE FLOATS 2018 (2019 floats to be advised): Cathay Pacific Airways Limited, China Construction Bank (Asia) Corporation Ltd, China National Tourism Administration, Hong Kong Disneyland, The Hong Kong Jockey Club, Macao Government Tourism Office, Ocean Park Hong Kong, Quality Tourism Services Association, Hong Kong Tourism Board. 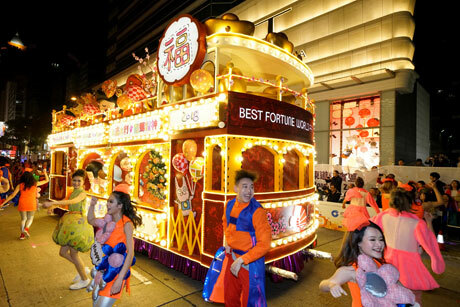 Hong Kong Tourism Board's float for the 2018 Chinese New Year Night Parade was modelled on Hong Kong's iconic "ding ding" tram. 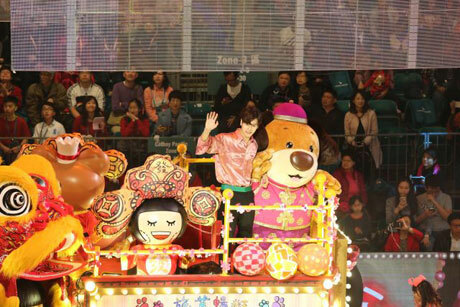 "Hong Kong Tourism Envoy" Jackson Wang joined HKTB's float for the first time to greet the crowd. 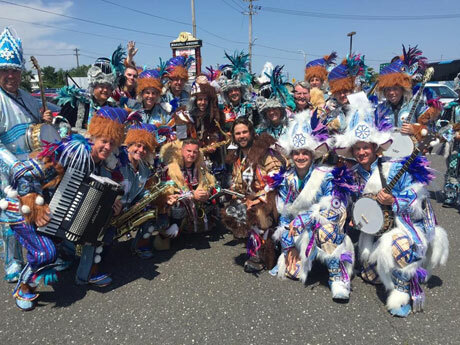 NINE INTERNATIONAL PERFORMING GROUPS (2018): Hainan Women's Crystal Troupe (China), Shantou Acrobatic Troupe (China), Parisian Street Cabaret (France), Kyoto Intercollegiate Festa Kyouen-Sodefure (Japan), Sanrio Family (Japan), Kakao Friends (Korea), Street Circus (The Netherlands), American String Band from Philadelphia (USA), Seattle Sea Girls (USA). ELEVEN LOCAL PERFORMING TROUPES (2018): Avon Lee International Magic, Belly Princess Liina Cheung Dance Company, BLS Dance Production, Hong Kong Chinese Martial Arts Dragon and Lion Dance Association, Hong Kong Cheung Keung Martial Arts Association and Hong Kong Yang Jiang Volunteer Association, Hong Kong Rope Skipping Academy, Infinity Dance Studio, Jean M Wong School of Ballet, Refiner. Yi Ming. The Moving Drums, The Pegasus Vanguard, Triforce. 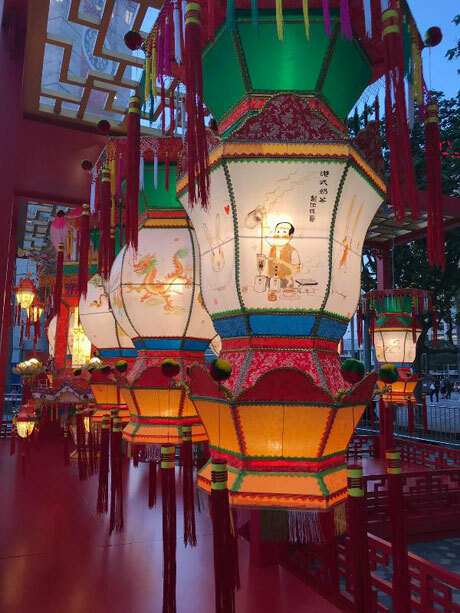 * Some 2019 floats will be on display at Lam Tsuen, Tai Po from the second day of Chinese New Year and at other locations on other dates (to be advised). International Float Exhibition - from 17th February to 4th March 2018 from 9am to 7pm at Lam Tsuen Wishing Square - a display of floats from the Cathay Pacific International Chinese New Year Night Parade (see above). Food Carnival with local snacks, seafood specialities and traditional Hakka food. Traditional Joss Paper throwing. Wishes are written on small placards which are attached to oranges and tossed into a wishing tree. According to tradition only wishes which hang on the branches without falling off come true. Wishing Lanterns Lighting Ceremony. Based on traditional custom, people write their wishes on wishing lanterns and float them onto a wishing pool hoping for best fortune in the forth-coming years. Wish Locks. To symbolize a love commitment towards each other, lovers write their names on padlocks which are affixed to fences or bridges in Europe, Japan, Korea and many other countries. Lam Tsuen Wishing Square presents wooden wish locks where people can write messages of love to relatives, friends and lovers. Well-Wishing Festival Celebration Night with meal and stage performances by Hong Kong artists. 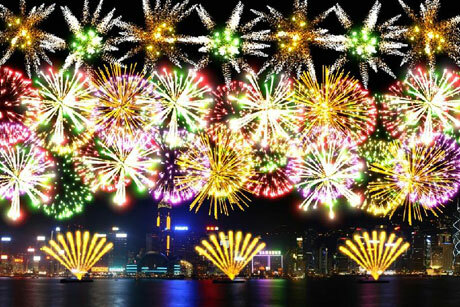 The 2019 fireworks display will take place at Victoria Harbour on the second day of Lunar New Year at 8pm on Wednesday 6th February 2019. A total of 23,888 firing shells will be discharged in the display from three barges in a 23-minute display consisting of eight scenes. 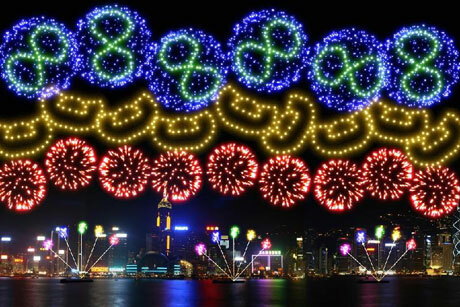 Highlights of the fireworks display include the display of the number "8" and golden ingots in the first scene to symbolise a prosperous year to come, as well as the display of pig noses and Saturn rings alongside the theme song of local comics character McDull in the second scene, wishing people all the best in the Year of the Pig. Strobes and waterfall-like effects in the fourth scene, "When I fall in love", will create a romantic ambience, sending wishes to all lovers for the Valentine's Day that follows the Lunar New Year. The fireworks display will reach its climax in the last scene with the firing of 10 seven-inch shells featuring brocade crowns and purple pistils simultaneously in celebration of the 70th anniversary of the founding of the People's Republic of China. The display can be seen from many vantage points on both sides of the harbour including Tsim Sha Tsui, the Mid-levels, Central, Wan Chai and Causeway Bay. The event is co-ordinated by the Home Affairs Bureau and sponsored by Shimao Group and supported by the Friends of Hong Kong Association. Spectators can tune in to Radio Television Hong Kong (RTHK) Radio 4 (FM 97.6 to 98.9) for synchronised music. 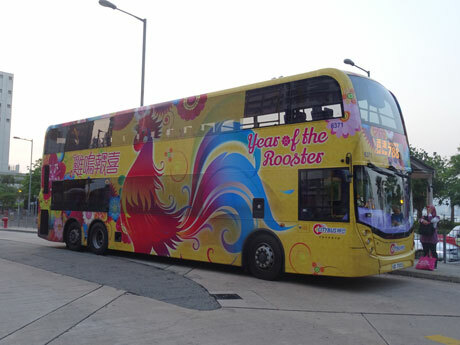 The 2018 Lunar New Year Fireworks Display which was to have been held on the second day of Chinese New Year, Saturday 17th February was cancelled as a mark of respect to the deceased and families of a serious bus accident which occurred on 10th February 2019. The 2017 display was watched by and estimated 241,900 spectators in Kowloon and 44,600 on Hong Kong Island. CHINESE NEW YEAR RACE DAY - On Thursday 7th February 2019, the third day of Chinese New Year racing fans can try and get the new year off to a prosperous start amidst the frenetic atmosphere of Chinese New Year Race Day at Sha Tin Racecourse, where an attendance of about 90,000 is expected. Admission is from 10-30am, with racing from 12-30pm to 6pm. Admission to the public enclosure is HK$10. On production of valid travel documents bona-fide tourists can obtain a Tourist Badge for HK$130 allowing entry to the Hong Kong Jockey Club Members' Enclosure. Entertainment includes a spectacular opening variety show in the parade ring with performances by popular local TV stars, a Fortune Tips Forum with a fung shui master and lion and dragon dance performances. A Lunar New Year gift will be given free to all spectators on entry to the racecourse. In addition to normal public transport, free shuttle buses will operate to the racecourse from Ching Tak Street, Wong Tai Sin (Wong Tai Sin MTR Station Exit D2) from 10-15am to 2-45pm. The 2018 Chinese New Year Race Day attracted an attendance of over 90,000 spectators at Sha Tin Racecourse with a further 6,000 attendance for cross-betting and viewing on screen at Happy Valley Racecourse. The Lunar New Year Cup, organised by Hong Kong Football Association, dates back to 1948. The LUNAR NEW YEAR CUP 2018 was held at Mongkok Stadium on Monday 19th February (the fourth day of Chinese New Year) and features both women's and men's Hong Kong Representative teams. At 1-15pm Hong Kong Women's Representative Team played Armed Police Force of Nepal (Women) followed at 4pm by Hong Kong Representative Team v Hong Kong League XI. Tickets were priced at HK$100 for adults and HK$30 for child and senior. The 2017 Nike Lunar New Year Cup tournament took place on 28th and 31st January at Hong Kong Stadium and featured local team, Kitchee and overseas teams, Auckland City (New Zealand), FC Seoul (South Korea) and SCG Muang Thong United (Thailand). The knockout stage took place on 28th January when Auckland City beat FC Seoul 1-0 and Kitchee defeated SCG Muang Thong 5-4 on penalties after the score finished 1-1 at the end of normal time. The losers played off for third place on 31st January with Muang Thong beating Seoul 1-0 whilst Kitchee and Auckland City contested the final with Auckland winning 1-0. Major shopping malls, department stores and shops, convenience stores and supermarkets remain open remain open throughout the Chinese New Year period. Sogo Department Store in Causeway Bay opens from 1pm to 10pm on the first day of Chinese New Year. Some malls, including Times Square, will operate extended shopping hours prior to and on the first two days of Chinese New Year and all major shopping malls have festive decorations. Some shops may open later than usual on Chinese New Year's Day. However, many small local shops close on Chinese New Year's Day and some also close on the following two days. SYMPHONY OF LIGHTS - On 4th and 5th February 2019, the nightly light and sound show "A Symphony of Lights" will take place as usual at 8pm. However there will be no background music or narration in the area outside Hong Kong Cultural Centre and Hong Kong Museum of Art in view of rehearsals for the Chinese New Year Night Parade. Background music and narration will continue to be broadcast in the area around Golden Bauhinia Square at Wan Chai. On 6th February, "A Symphony of Light" will take place as usual at 8pm whilst the Lunar New Year Fireworks Display, which also commences at 8pm, takes place but there will be no Symphony of Lights background music or narration. There will, however, be live background music related to the fireworks display. HONG KONG DISNEYLAND - Hong Kong Disneyland's Chinese New Year Celebrations run from 18th January to 4th March 2018 and include a Chinese New Year Night Market, seasonal gifts, festive menus at its dining establishments and special Chinese New Year room decoration packages at its hotels. Hong Kong Disneyland's opening hours during 2019 Chinese New Year - 9-30am to 8pm on Chinese New Year's Day, 5th February 2019 then 9-30am to 9pm from 6th to 11th February 2019. Tickets - Standard admission tickets are valid. Normal ticket prices apply. During Chinese New Year on 12th February 2013, a new daily attendance record was set at Hong Kong Disneyland when 44,872 visitors visited the park. OCEAN PARK - Opening hours - 10am to 8pm on 5th February 2019, 9-30am to 7-30pm on 6th & 7th February and 10am to 7pm from 8th to 10th February 2019. Note - Ocean Park may suspend ticket sales at certain times if the attendance inside the park at any one time is near to the park's 36,600 capacity. NGONG PING 360 - Ngong Ping 360 cable car operates extended hours 9am to 8pm on 5th to 8th February 2019, 9-30am to 6-30pm on 9th and 10th February and 9-30am to 6pm on 11th to 15th February 2019. A thematic Lantern Display "Glittering Peacocks in Full Bloom" takes place at Hong Kong Cultural Centre Piazza from 25th January to 24th February 2019 from 6pm to 11pm. Admission is free. The display showcases various eye-catching peacock lanterns. A giant peacock lantern over 5 metres tall and 15m long is the centrepiece, with its long glittering tail forming an archway between the two pools. 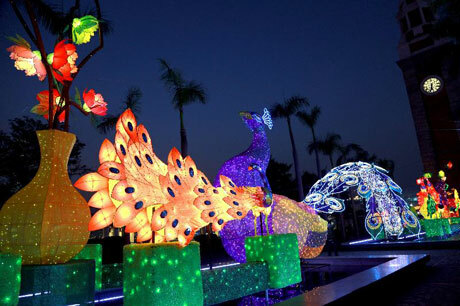 In addition, more than 10 lanterns of peacocks, elegant vases and colourful peonies will also be on display, wishing the public abundance and success in the New Year. 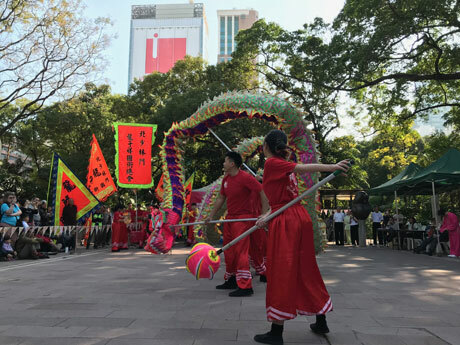 Lunar New Year Carnivals include Chinese song and dance performances, crafts demonstrations and roving performance (further details to be advised) take place on different dates at Hong Kong Cultural Centre Piazza. North District Park and Tin Shui Wai Park and Ginza Square. At all three carnivals folk craft masters from Guangdong, Macao and Hong Kong will give demonstrations on Xiguan copperware making, Luxi murals, juci (ceramic repair), guqin making and dough figurine crafting. 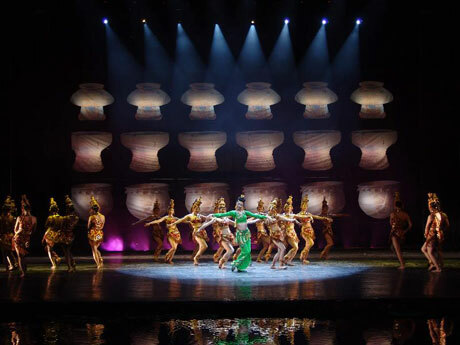 The Hubei Arts Troupe, supported by the Hong Kong, Macao and Taiwan Affairs Office of the Ministry of Culture and Tourism, will also showcase spectacular ethnic songs, dance and martial arts performances. Youth Night Monday18th February 2019, 7-30pm to 9-30pm. Youth Night Saturday 16th February 2019, 7-30pm to 10pm. Lantern Display - Thursday 14th to Tuesday 19th February 2019. Youth Night Sunday Sunday 17th February 2019. 7-30pm to 9-30pm. Admission to all carnivals and lantern displays is free. SIK SIK YUEN WONG TAI SIN TEMPLE (except the Tai Shui Yuenchen Hall) is open from 7am on Chinese New Year's Eve, 4th February 2019 until 5-30pm when it will close until 9pm. When it reopens at 9pm it will remain open throughout the night and close at 6-30pm on Chinese New Year's Day, 5th February. Visitors wishing to be present at the beginning of the Year of the Monkey will be able to wait in the space in front of the temple's main altar, which can accommodate 1,000 people, for two worshipping slots at 11pm and midnight. However, the usual areas for shaking fortune sticks, kneeling and leaving offerings will be closed. On 6th and 7th February, the temple opening hours will be 7am to 6-30pm. The Tai Shui Yuenchen Hall at Sik Sik Yuen Wong Tai Sin Temple is closed on 4h & 5th February but will open from 8am to 5pm on 6th and 7th February 2019. Police will implement crowd safety management and special traffic arrangements to facilitate worshippers visiting the Wong Tai Sin Temple during the Lunar New Year period. Crowd safety management measures will be put into force from 9pm on 4th February to 7pm the following day, and daily between 7am and 7pm from 6th to 11th February. Police will set up queuing areas at Wong Tai Sin Temple Court, Wong Tai Sin Square, and northern pavement of Lung Cheung Road. Should the temple be overcrowded, a “tidal flow system” will be implemented and Police officers will direct worshippers to enter the temple in groups. CHE KUNG TEMPLE will open from 7am 4th February, until to 6pm, when it will close. The temple will reopen at 11pm and remain open until 6pm on 5th February. On 6th February the temple will open at 7am until 6pm and reopen from 11pm through to 6pm on 7th February. On 8th February, opening hours are 7am to 5-30pm. MAN MO TEMPLE on Hollywood Road will open at 7am on Chinese New Year's Eve, 4th February and remain open until 7pm on 5th February. On 6th and 7th February, the temple will open from 7am to 6pm. Hong Kong Maritime Museum is closed on 5th & 6th February, the first two days of Chinese New Year. It closes at 4pm on Chinese New Year's Eve, 4th February and is open from 9-30am to 5-30pm on 7th & 8th February 2019. Hong Kong Racing Museum is open as usual throughout the Chinese New Year period. On 5th & 6th February 2019, the operating hours of the Hong Kong Tourism Board (HKTB) Visitor Hotline (852) 2508 1234 will be extended from 6pm to 9pm (services during the extended operating hours are available in Cantonese, English and Putonghua only). All public libraries will be closed at 5pm on Lunar New Year's Eve, 4th February 2018 (except that those libraries whose normal closing day is Monday will be closed all day).. All libraries will be closed from 5th to 7th February. The opening hours of all public libraries on 8th February will be the same as those for public holidays. Hong Kong Immigration Department estimates that around 7.32 million passengers (including Hong Kong residents and visitors) will pass through its sea, land and air control points during the forthcoming Lunar New Year festive period from 4th to 10th February 2019. Among them, about 75%, or around 5.47 million passengers, will pass through land boundary control points. The number of outbound passengers will be at its highest on Wednesday 6th February with over 454,000 passengers departing Hong Kong, while the number of inbound passengers using land boundary control points will reach its peak on Thursday 7th February, with around 506,000 passengers arriving in Hong Kong. Lo Wu will be the busiest control point, and it is estimated that there will be around 1.69 million passengers, with a daily average of about 242,000 passengers, travelling via this control point during the festive period. The passenger traffic at the Shenzhen Bay and Lok Ma Chau Spur Line control points will also be heavy, with daily average forecasts of about 141,000 and 132,000 passengers respectively. To cope with the anticipated heavy traffic during the festive period, the Immigration Department has redeployed additional staff to reinforce various control points and has minimised leave for frontline officers for flexible deployment and operation of extra clearance counters and kiosks. Additional security guards will also be deployed to provide crowd management support. Furthermore, the Immigration Department, the Police, the Customs and Excise Department and the MTR Corporation Limited will set up a joint command centre at Lo Wu Control Point to make necessary arrangements. Immigration Department will also establish close communication with the Mainland frontier inspection authorities. To ensure smooth passenger traffic flow, passenger conditions will be closely monitored and appropriate traffic diversion plans will be adopted when necessary. Furthermore, passengers may also check the estimated waiting times of all land boundary control points at any time or place via the Immigration Mobile App. They can then plan their trips effectively and save time queuing up at control points. The ImmD Mobile App can be downloaded free of charge from the Apple App Store (supports iOS version 9.0 or above) and Google Play (supports Android version 5.0 or above). 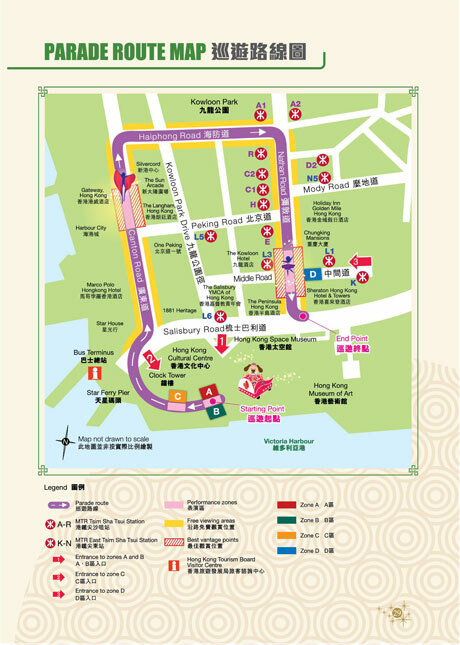 Special traffic and transport arrangements will be implemented in Tsim Sha Tsui for the 2019 Cathay Pacific International Chinese New Year Night Parade to be held on the first day of the Lunar New Year, 5th February 2019. The parade will start at 8pm at the Hong Kong Cultural Centre and travel via Canton Road, Haiphong Road, Nathan Road and Salisbury Road to the outside of the Sheraton Hotel. * Road closures and traffic diversions will be implemented in the Tsim Sha Tsui area south of Austin Road. Additional road closures may be implemented depending on the crowd situation. Motorists are advised to pay attention to traffic signs and police directions. * Regarding public transport services, about 42 bus routes and six green minibus routes will be temporarily diverted. The public transport operators concerned will put up notices to inform passengers of the arrangements. * All bus stops, green minibus stands, taxi stands, roadside parking spaces and car parks affected by the road closures will be temporarily suspended. Members of the public planning to go to the affected area are advised to avoid driving and use public transport services as far as possible and pay attention to the arrangements for route diversions and suspension of stops. They should also plan their journey early and allow more travelling time to cater for unexpected delay. Motorists should exercise tolerance and patience in case of traffic congestion and take heed of police instructions. The Transport Department and the Police will closely monitor the traffic situation, and implement appropriate measures as necessary. Special traffic and transport arrangements will be implemented on Hong Kong Island and in Kowloon to facilitate the Lunar New Year Fireworks Display on the second day of the Lunar New Year, 6th February 2019. Road closures and traffic diversions will be implemented in phases on Hong Kong Island from about 1pm onwards at Tramway Lane outside Garden Road Lower Peak Tram Station, Wan Chai District, Central District, the Peak and the section of Island Eastern Corridor westbound between Victoria Park Road and Man Hong Street. Road closures and traffic diversions will be implemented in phases in the vicinity of Tsim Sha Tsui and Jordan in Kowloon from about 6pm onwards until the crowd is dispersed and road closures are lifted. In connection with the road closures, some bus and GMB stops will be suspended or relocated. Bus and GMB routes operating in the affected areas will also be temporarily diverted, while the service of some routes may be strengthened subject to passenger demand. From 6pm to 10-30pm, the services of Island Line and South Island Line will be strengthened with an about three-minute headway; from 8-30pm to 10-30pm, the services of Tsuen Wan Line and Kwun Tong Line will be strengthened with about a three-minute headway and about a four-minute headway respectively; from 8pm to 10-30pm, the services of Tseung Kwan O Line between North Point Station and Po Lam Station, and between Tiu Keng Leng Station and Lohas Park Station, will be strengthened with about a four-minute headway and a 12-minute headway respectively. In addition, from 8-30pm to 11-30pm, the service of West Rail Line will be strengthened with a four-minute headway. Normal holiday service will be operated and the frequency of the tram service will be strengthened to meet passenger demand if necessary. The service of Central-Mid-Levels Escalator and Walkway System will be extended overnight to 2am on 18th February. The terminus of the cross-boundary coach services between Wan Chai and Huanggang at the Wan Chai North Temporary Public Transport Interchange will be suspended from about 6-30pm until the road closure is lifted. A temporary terminus will be provided at Hennessy Road eastbound underneath O’Brien Road footbridge. Ferry companies will temporarily adjust the services to facilitate the holding of the fireworks display. Due to extensive road closures, it is anticipated that traffic in the vicinity of the affected areas will be significantly congested. Motorists are advised to be patient in case of traffic congestion and follow police instructions. In addition, other ad-hoc traffic and public transport measures, including additional road closures, traffic diversions, alteration and suspension of public transport services may be implemented by the Police depending on actual traffic and crowd conditions in the areas. Members of the public who plan to go to the affected areas are advised to use public transport services as far as possible, particularly railway services, and avoid driving to the affected or congested areas unless necessary. Public transport commuters are advised to pay attention to the arrangements of route diversions, suspension and relocation of stops. Moreover, motorists and members of the public are advised to stay alert to the latest traffic news on radio and television. All post offices will be closed on the first three days of Chinese New Year from 5th to 7th February 2019, with the exception of the General Post Office at 2 Connaught Place, Central and Airport Post Office, which will remain open. The business hours of these two post offices will be from 9am to 5pm and 8am to 5pm respectively. There will be no mail delivery during the period 5th to 7th February. On February 5th, the first day of the Chinese New Year, one mail collection will be made for the posting boxes of the General Post Office, Kowloon Central Post Office, 405 Nathan Road, Yau Ma Tei and Tsim Sha Tsui Post Office, 10 Middle Road, Tsim Sha Tsui. On February 6th and 7th one mail collection will be made for the posting boxes of the General Post Office and Airport Post Office. All Leisure and Cultural Services Department (LCSD) parks and playgrounds will remain open during the Lunar New Year holiday. Leisure Link Internet and telephone reservation services will also operate as usual throughout the holidays. Services at gazetted beaches will be suspended. Stadia and all sports grounds will be closed unless advance bookings have been made. Holiday camps will be closed during the first three days of the Lunar New Year and lodging will not be provided on Lunar New Year's Eve, 4th February 2019.
Leisure Link booking counters at venues will not operate when the venues are closed. For venues scheduled to reopen on the third day of the Lunar New Year, their Leisure Link booking counters will also resume operation from the same day.